Local elected officials have started holding workshops to enroll residents in Senior Citizen Rent Increase Exemption (SCRIE) and Disability Rent Increase Exemption (DRIE) programs since a report came out earlier this year noting that less than half of eligible tenants are receiving the benefits they are entitled to. State Senator Brad Hoylman, along with State Senator Daniel Squadron, Assemblyman Brian Kavanagh, Manhattan Borough President Gale Brewer and Congresswomen Carolyn Maloney and Nydia Velazquez, most recently hosted an event at 535 East Fifth Street on October 23 to encourage eligible seniors and disabled residents to sign up for the program that would freeze their rent, and the workshop was attended by about 30 tenants. SCRIE and DRIE, collectively known as the New York City Rent Freeze Program, is available to seniors over age 62 and tenants with disabilities. Eligible tenants receive rent increase exemptions through a property tax credit and the income threshold increased to $50,000, from the previous limit of $29,000, earlier this year. Attorneys from Legal Aid and legal firm Skadden Arps were available at the workshop to help residents complete their paperwork but Senator Hoylman noted that filing for the benefits doesn’t necessarily require a fine-tuned legal mind. Senator Hoylman cited the low enrollment specifically in Stuyvesant Town as one of the motivating factors for holding the workshops. The report from the Department of Finance found that Stuy Town was one of the most underenrolled neighborhoods in the city, with only 1,317 out of 5,144 eligible residents enrolled in the program, meaning that only 25 percent of eligible seniors and tenants with disabilities are receiving benefits. Liliana Vaamonde, Director of Training for the Civil Practice with Legal Aid, also noted that education is an important component for enrolling residents in the program, mainly because of the recent changes in the income limit. Vaamonde added that there are a few misconceptions about the program that residents have at the workshops as well, relating to eligibility and the income level. She clarified that some tenants are confused about why they are not eligible even though their own income is below the $50,000 threshold. “It’s about the household and not their individual income, so even if a primary tenant has an income below $50,000, other members of the household might bump it up too high,” she said. She also clarified that the program is only available to tenants who live in rent-regulated housing and they often get questions about eligibility from residents in public housing or privately owned buildings who do meet the income requirements. “This is all contingent on the fact that they have rent stabilized housing,” Vaamonde said. 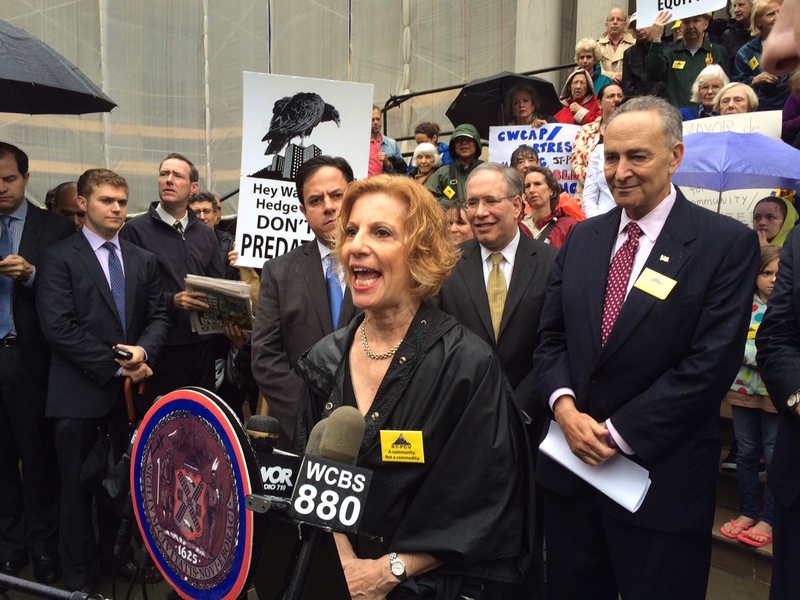 Assemblymember Linda Rosenthal, who represents the Upper West Side, has been doing her part to increase education about the program, with legislation that requires landlords to notify tenants about programs that would freeze their rents. Assemblymember Rosenthal announced this past Monday that the bill had been signed into law by Governor Andrew Cuomo. The Stuyvesant Town-Peter Cooper Village Tenants Association, via an email blast sent out late Thursday, is urging residents to attend a rally at City Hall on Monday at 9 a.m. Read on for details. Is your rent more than $4,000 . . . less than $2,500 . . . or anywhere in between? On June 15–less than four months from now–all rent protections will end unless renewed by the state legislature and the governor. By March 11, New York City needs to renew the rent laws too. Without renewal, you may not be able to afford your rent. Every one of us is affected. Ambushed by a massive rent increase on renewal? Tired of paying MCIs forever? Kickoff event: Monday, March 2, at 9 a.m.
Rally on the steps of City Hall. Attend hearing afterward, City Council chambers, 2nd floor. We’ll be sending you more information soon. If you don’t act . . . Without rent stabilization, there will be no limits on rent increases and no automatic right to a lease renewal. We could all face eviction at the landlord’s whim. Without renewal of rent stabilization, Roberts means nothing and SCRIE/DRIE will disappear. We can win only if you participate. Want to do even more? Let us know by phone or email. Have you considered volunteering with us? If you have special skills or want to help distribute flyers and talk to neighbors in your building, let us know by calling the Message Center at (866) 290-9036 or signing up at: http://stpcvta.org/neighbor.network.